Ok so try and picture a movie about 2 friends who happen to be girls and who happen to be incredibly beautiful. Now picture these two beautiful women hugging in a room full of blood. Why picture them doing that, because there not only incredibly hot, but also completely insane. 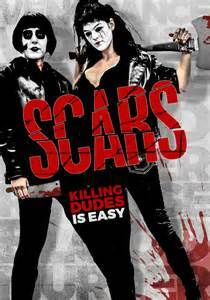 Scars is the story of two women. One a lovely punk rockish lady who wears cat like make up. One day her husband or boyfriend asks her to grab him a beer. She does, then smashes the bottle over his head and stabs him to death. Our other lovely lady enjoys dating married men. After she seduces them she also enjoys blackmailing them. She has a nice flat rate as well. Five grand up front then two grand a month after that. One night her blackmail doesn't go so well after her jilted lover starts beating the crap out of her. Luckily our other beautiful lady is around to kill the guy thus saving her. As the two become closer friends they both realize how much they enjoy killing men. Through various means they meet, and violently kill random men the encounter. Unfortunately there not overly good at covering up the crimes and soon a detective begins hunting them. I could try and do a makeshift comparison like picture "insert movie title here" now picture it with 2 serial killing women, but that would do it no justice. This is a film that is not only incredibly well done, but original as well. Part slasher, part coming of age, part art house, I've never really seen a film like this. Aside from being gorgeous, the two female leads do an amazing job portraying there roles. Relying on mannerisms, as they don't have tons of dialogue they covey a sense of fear to the audience, as well as making you feel almost sympathetic to what there going through, and doing. If you like movies then watch this. Doesn't matter what type as I stated it fits into so many different categories, and succeeds on so many levels that you can't compare it to anything. Just trust me when I say to go pick this up.